The lingerie industry is in a deeply transformational phase, one that is greatly influenced by today’s holistic wellness movement, as well as trends and technological advances already seen in the athleisure business. These days, consumers are increasingly in search of lingerie that is well made, with branding that conveys positive values and encourages feelings of self confidence. All criteria leading to products that will become increasingly transitional, hybrid and evolutionary, intended to accompany us throughout our days (and nights), our travels and all year round. This text was originally published as an interview of Jessica Boukris and Alison Beckner, the cofounders of Inside/Out Women, by Nardjisse Ben Mebarek of Nelly Rodi for their 2019/2020 Lingerie Inspiration Box. NELLY RODI: At NellyRodi, we have found that the boundaries between traditional lingerie and well-being are becoming more porous. Consumers no longer hesitate to repurpose athletic apparel to wear in daily life… How do you explain this phenomenon? INSIDE/OUT: The distinction between lingerie, activewear and transitional clothing are blurred. The huge commercial success of the sports bra is an interesting example. Push-up bras have become affiliated with a form of constraint imposed on women; they are gradually fading out in favor of products with technological innovations that provide just as much support but with less reinforcement. Athletic bras provide comfort and softness, while also conveying power as they are associated with sports. In the lingerie world, we are also seeing an increase in the use of athletic materials like mesh and microfiber, as well as ‘sporty’ styles that replace classic undies. Thinx - a New York based brand that makes underwear with built in periodic protection - is another good example of the budding relationship between lingerie and wellness. Finally a brand of lingerie offering underwear that is innovative, technical and hygienic, adapted to an active lifestyle, and with fun and attractive marketing. Body activism and personal development have a big buzz on social media and online, supporting a new attitude towards and a new relationship to one’s body. Simultaneously, new wellness experts arrive on the scene, revolutionizing the subject. What is your point of view on this matter? Yes, for several years now the digital world and Instagram in particular have been the outlets of choice for this ‘rebirth of the body.’ Many players in the wellness world have created their communities here, creating bridges between sports, beauty, spirituality, femininity… This is a sign that wellness has become holistic. This also allows many emerging brands, with low budgets but agile strategies, to receive the recognition and visibility they need to reach their customer base, encourage discussion and get feedback. And it is precisely this generation of consumers who are sticklers for authenticity and will not be bossed around. The body positive mantras have flourished as well, with messages advocating liberation. ‘Strong is the new pretty’ and so on. These new brands appeal to women by calling them to be proud of their very unique and imperfect bodies. No filters, no retouching. And of course they succeed. New brands are emerging and challenging the market. Ones like Baserange, Superb Paris, Outdoor Voices, Yuj. What are the values that unite them? Was there no offer so far in this sector? Regarding athleisure, emerging brands such as Outdoor Voices, Lululemon and Girlfriend Collective have, since their creation, brought fresh air into the sports industry with what we like to refer to as a ‘look good, feel good’ ethos: impeccable cuts, quality materials, color palettes closer to those we see on the runway, offbeat branding and messaging created to appeal to real consumers and not just mythical star athletes. We are finally out of the mindset where products for women are simply adapted from those made for men (think: ‘Pink It and Shrink It’). A real revolution and this is just the beginning. These brands use models of all sizes, communication images that not retouched, showing women with visible body hair, stretch marks, scars. Women of all backgrounds and age groups…and products that are adapted to them all. The messaging is infused with positivity and empowerment. Finally, production is becoming increasingly focused on sustainability, eco-consciousness and sourcing or producing locally. Pansy Campaign by Nastassia Brückin. In France in the early 2000s (earlier in the US) brands like Calvin Klein and Erès ushered more sobriety and minimalism into the lingerie industry. And while the famous campaigns and microfiber had their moment, the moment didn’t last - it felt more like a formatted trend than a sincere movement. Inevitably, many women - including us - didn’t find what we were looking for there, both in terms of products like the (inevitable) pushups and underwires, in terms of the materials whose quality and manufacturing were often sub-par. And all that lace! It can still be quite difficult to avoid it here. Also, the majority of so-called mainstream brands were still portraying very limited body types, without much diversity and overall objectifying women. Here again, a freshness is upon us through products with clean design and a variety of bodies. Baserange and Pansy are two of our favorite examples. 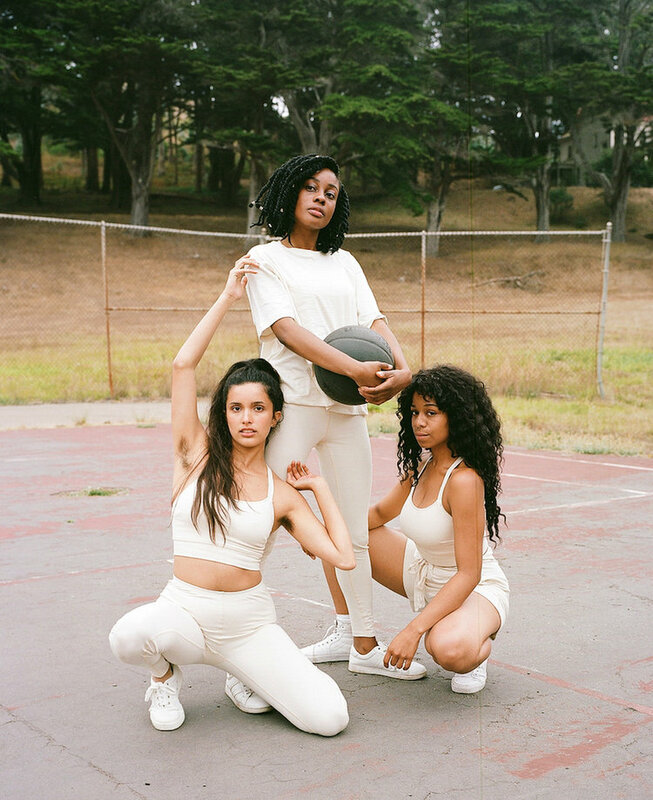 In terms of messaging, the latter is, in fact, very close to that of Girlfriend Collective, the athleisure equivalent and anothre brand that we love. This new positive and inclusive tone can be found among the majority of these emerging brands, whether labeled athleisure, softleisure or lingerie. How do these brands arouse desire among consumers? Why are they so highly lauded? Ar they the new lingerie stars? These new lingerie brands align with our lives and our styles. Their messages are both fun and high-end; they do not take themselves too seriously and yet convey values that are meaningful. They are incarnated - and this is essential - by women who are like us or who inspire us. In their look books, Baserange (mentioned above) collaborates with conscious women, sometimes activists, women with strong backgrounds, messages that speak to us. Real women in many ways… It becomes much easier to identify with them and to imagine wearing what they wear, simply because we can relate to them and their stories. We’ll take talk about travel, maternity and tolerance over Valentine's Day or the best summer bikini anytime.